Pay attention, pay attention, this is going to be convoluted – bwahahaha, like you didn’t know. Being a lover of winter, I love snowflakes like piecrust and snowballs like doughballs, and my criteria for edible cake is whether or not you could take a fistful and make a snowball doughball, and it so happens that through your excellent photography and excellent recipe for whitecake (as opposed to yellowcake – who would eat uranium?) I am able to discern that your whitecake has sufficient moisture content to become a snowball doughball. Clear? (I think I left a comma out somewhere.) Furthermore, you have tsunamis of frosting that you could surf on the top of said whitecake. Ergo…ergo, I give this one 5 cleavers! Like I didn't know. I had a feeling this one might get the coveted "5 cleavers" for the very reason of "snowball doughball" potential! Hi Jean, your cupcake recipe looks so yummy! Thanks for sharing the recipe! Have a nice long holiday weekend. Thanks, Julie! I prefer them without the almond extract, but some people really like it especially for a wedding theme. These look perfectly, wonderfully, delicious - and the recipe would be moist enough to really tempt me! Thank you for sharing it. Jacqueline, thank you! When you give in to the temptation, let me know how they turned out for you! Jean, your cupcakes look wonderful and cupcakes are always a hit for tea time. Enjoy your upcoming long weekend and thank you for joining me for tea. Jean, these look sooooo delicious. My granddaughter is having cupcakes instead of a wedding cake at her wedding this weekend. Thanks, Linda! Enjoy the wedding! How I would have loved to have my grandmothers at my wedding. These look great, Jean! Just add strawberries and blueberries, perfect for the 4th of July....may try that out! Thank you for sharing a great recipe! Thanks, PP! Great idea -- they'd look so pretty (and taste good) decorated with strawberries and blueberries. I made a white cake the other day very much like this and everyone loved it. Hopefully I'll blog mine soon. Thank you, Mildred! Hugs to the cats! I love just how light and soft it looks. They taste great even without that fancy frosting. Angie, thanks! 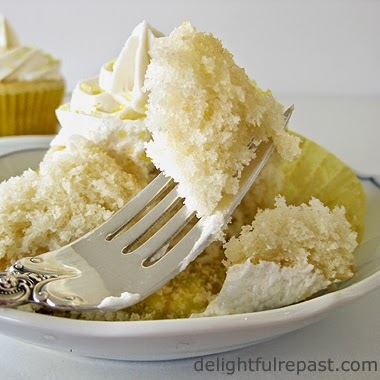 I always scrape the frosting off cakes and cupcakes, even when the frosting is very good. I just put it on for other people! White cake with white frosting is so simple and delicious. Elegant, really. I'll be marking this one. Thanks, Lorrie! You can dress them all sorts of ways -- even sugar pearls. White cake is my favorite. This looks so moist, dense, and delicious, all wonderful characteristics of the perfect white cake, in my book. Thank you, Judy! And they seem to stay moist for a few days. This recipe looks wonderful! I love recipes so here is another winner! Thank you, Bernideen! Cake and tea! These look and sound delicious. I find it so hard to photograph white recipes, you've nailed it! Sarah, thank you so much! I'm glad you like the photos! I like a bit of alliteration. "Wonderful White Cup cakes." 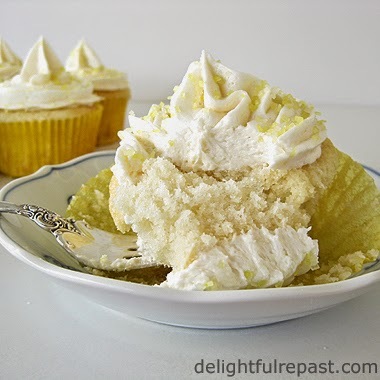 How about "Wonderful Wistful White Cup Cakes? No, that doesn't sound right. Wistful.... why? How about Wonderful Wacky.... no wacky doesn't sound right either. Maybe a competition for the best alliterative title for your cup cakes? What do you think, Jean? If anybody is really clever, they could get some assonance and perhaps even some rhyme in there too. Now, that would be something, Jean. Tony, alliteration is one of my favorite literary devices. Too bad they're not wupcakes! Thank you so much, April! Much appreciated! Jean, I'm sitting in my Alaska hotel room drinking coffee right now wishing I had some of these cupcakes to go with it. That is really white cupcakes, my kids will love it, pinning and tweeting. Thank you, Swathi. I appreciate it so much! White cupcakes are my favorite! My husband thinks it's so boring but they're truly the best. These look wonderful. I'll be trying them! Thanks so much for linking up with us at the Momma Told Me Link Party! We hope you'll share more soon! Thanks, Jen! I *will* share more soon. My husband's favorite is yellow or white cupcakes with chocolate icing. I'm with Sarah―the opening photo in its white, fluffy glory nearly took my breath away. Another great recipe, Jean! Yum Yum! Let me tell you, I am much more of a white cake and frosting lover than chocolate. I can leave the chocolate cake alone, but not white. lol! Thanks for sharing with SYC. Brooks, thank you! Such a compliment on my cake from YOU (THE cake guy!) means a lot. Thanks, Jann. That's exactly how *I* feel about it; I can leave the chocolate cake alone, but not white. Your Cupcake looks delicious, I would love it! Thanks so much for sharing your post with Full Plate Thursday. Hope you are having a great day and come back soon! Thanks, Miz Helen! I'm making more for the weekend. "See" you soon! Yea for the winner of the giveaway!! The cupcakes look amazing, Jean! Thanks, Kitty. It took me a while to come up with a white cupcake that was the perfect level of fluffy.